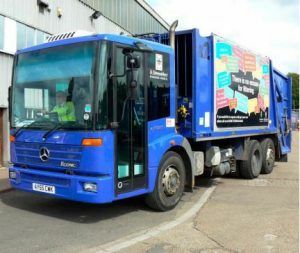 Following changes to waste disposal points, St. Edmundsbury Borough Council and Forest Heath District Council have used geographical information systems (GIS) to help reorganise bin collections, reduce carbon emissions and save £180 000. 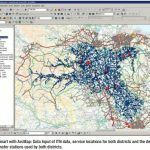 It was decided to use Ordnance Survey’s mapping data in conjunction with Integrated Skills Limited’s RouteSmart route optimisation solution and ESRI® ArcGIS. The two councils’ geography was divided into zones that could be collected in a single day using a set of vehicles (allowing each round to be changed or extended without changing the collection day). Detailed round design followed, ensuring that each round took about the same time and could be completed in the working day. Paper maps of new rounds were produced so that crews could operate in unfamiliar areas. All approved building developments were included in the design of the rounds to absorb future growth, which removed the need for an extra collection round. Current work includes reviewing the street cleansing services using the OS MasterMap® Integrated Transport Network™ (ITN) Layer – Urban Paths theme (as cleansing is carried out on footpaths and open spaces as well as roads) leading to a Shared Rural Channel Mechanical Sweeper service at a cost saving to both Councils – one vehicle now used instead of two.